6 to 9 Point Circle: What Is This About? Ah, Bh, Ch - the midpoints of AH, BH, CH - the so called Euler points. 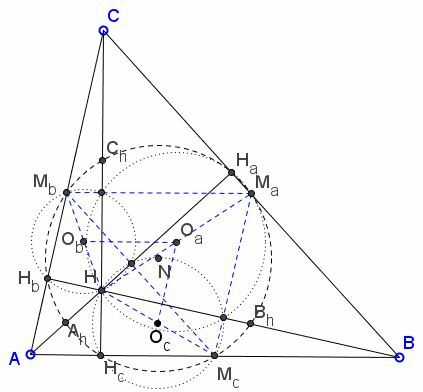 In a given triangle, the feet of altitudes and the midpoints of the sides are concyclic. Applying this statement to, say, ΔCAH we see that its circle (N) passes through the midpoints of its sides, viz., Ch, Ah, Mb and, of course, through the feet of the altitudes, which happen to be Ha, Hb, Hc. The circles (N) formed for triangles ABH also BCH, also pass through Ha, Hb, Hc so that all three coincide. The latter two pass through Ah, Bh, Mc and Bh, Ch, Ma, respectively. It follows that the common (N) circle passes through all the nine points.